Tuesday, May 15, 2018 at 4:00pm at Tupper Auditorium. 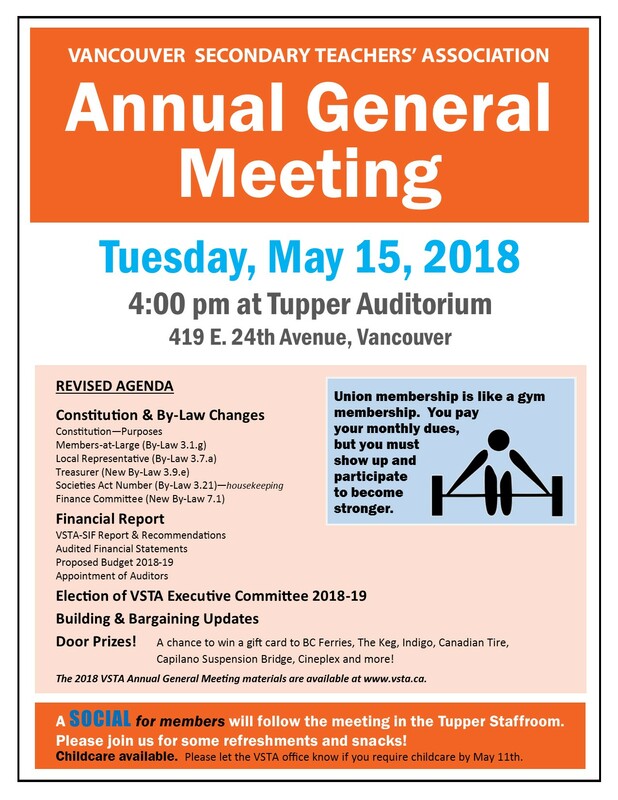 Members will receive financial reports, vote on the 2018-19 operating budget, elect the VSTA Executive for 2018-19, vote to approve by-law changes, receive updates on the the building and bargaining. Door Prizes! A chance to win a gift card to BC Ferries, The Keg, Indigo, Canadian Tire, Capilano Suspension Bridge, Cineplex and more! A social for members will follow the meeting. Childcare available – please let the VSTA office know by May 11th.